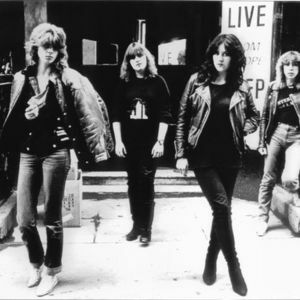 Girlschool started in 1975 when Enid Williams (Bass, Vocals) and Kim McAuliffe (Rhythm Guitar, Vocals) formed an all girl rock covers band called ?Painted Lady? in South London. Kelly Johnson and Denise Dufort later joined and in April 1978 they changed their name to ?Girlschool? Their first single ?Take it all away? was released on the ?City Records? label which led to them gaining a Mot?rhead support slot on the Overkill tour in 1979. After signing with Lemmy?s record company Bronze later that year, the band released their first album ?Demolition? in 1980. Kelly Johnson and Denise Dufort later joined and in April 1978 they changed their name to ?Girlschool? Their first single ?Take it all away? was released on the ?City Records? label which led to them gaining a Mot?rhead support slot on the Overkill tour in 1979. After signing with Lemmy?s record company Bronze later that year, the band released their first album ?Demolition? in 1980. After playing Japan in 1982, Enid left and was replaced by Gil Weston of The Killjoys and Girlschool recorded their third album ?Screaming Blue Murder?. After Kelly left to live in L.A. she was replaced by Cris Bonacci on lead guitar and singer Jackie Bodimead on lead vocals for the 1985 album ?Running Wild?. After many more line-up changes and releases on various labels, the original bassist/vocalist Enid rejoined the band in 2000 and in ?02 they released the ?21st Anniversary ? Not that Innocent? album. They are arguably the longest running female rock band in the world!